« Being can generate only being and if man is enclosed in this process of generation, only being will come out of him. » Besides, human reality can’t exclude the mass of being, but « man’s relation with being is what can be modified. 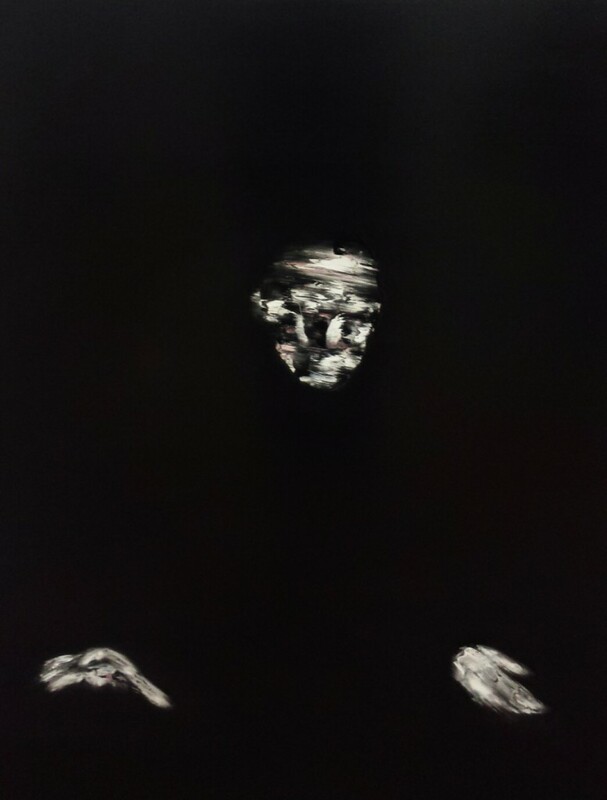 »1 Are Lorenzo Puglisi’s figures luminous beings plunged into total darkness or, on the contrary, do they face the metaphorical obscurity of their inner worlds ? This duality can be read in the pictorial texture : black is smooth and dense, white disrupts the canvas and is punctuated by reliefs, and sometimes enhanced by colored touches. 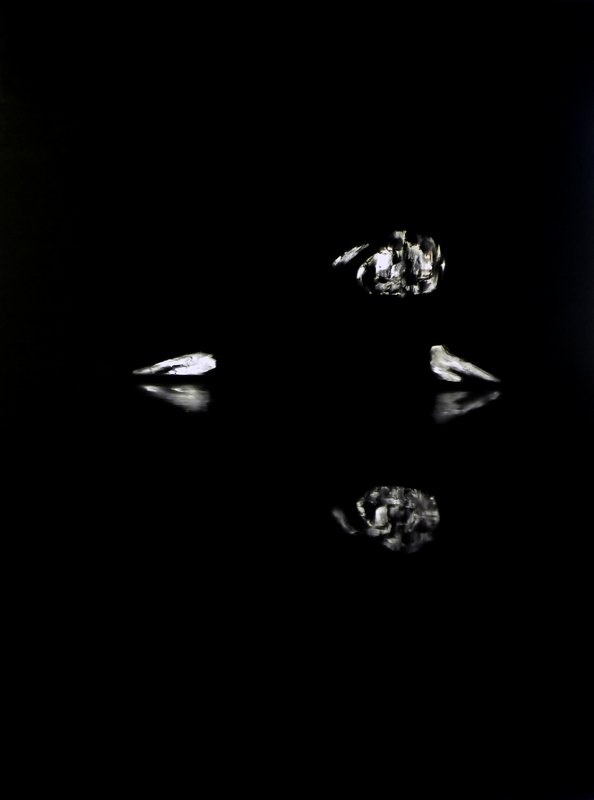 Character’s faces, hands and feet emerge from the black background. The artist isolates these parts of the body to reveal their expressive power : faces convey emotions, hands characterize gestures and feet symbolize human standing. By reducting the character to the structural elements of the expressive body, Lorenzo Puglisi tries to decipher the essence of portrait. The expressionist strokes suggest the dynamic of the figure -avoiding classical portrait stasis- as much as a superimposition of states, an expressive accumulation. The isolated character emphasizes the metaphysical aspect of human being facing nothingness, « this possibility for human reality to secrete a nothingness which isolates it. 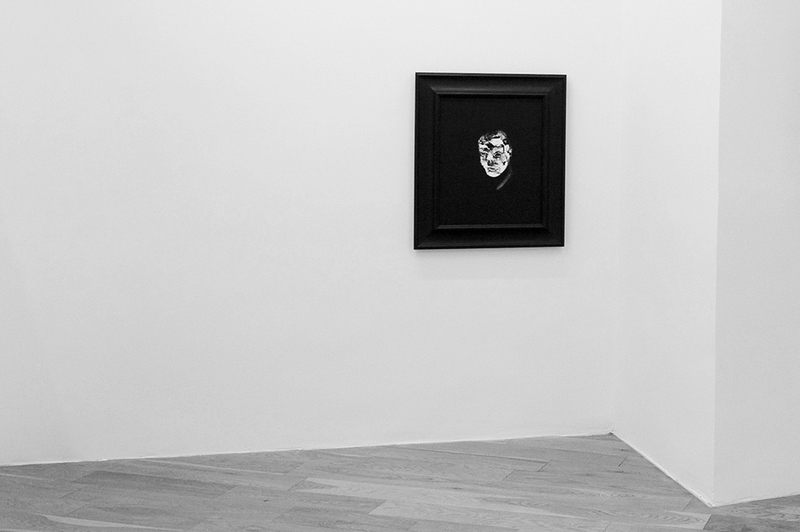 »2 : black color in Lorenzo Puglisi’s paintings could be the metaphor of it. In his recent series, the artist reinterprets great pieces of Art History (Leonardo da Vinci, Michelangelo…) which belong to humanity artistic heritage as they form a collective visual memory. Lorenzo Puglisi is interested in the construction of these cultural references : the composition of the painting evokes a familiar image for the viewer but the artist puts up a smokescrenn as only the positions of faces, hands and feet are visible. From this cultural base, he produces a new iconography, updating the representation modes. If creation expresses the need to rebuild reality or if it tries to fulfill existential uncertainties, it is, in the case of Puglisi’s paintings, an inescapable and relentless act. 3. Angelo Crespi, About the line of black, a text about Lorenzo Puglisi’s work. Angelo Crespi (Busto Arsizio, 1968) is a journalist and professor of History of journalism at Università Cattolica in Milan. Bruno Corà (Roma, 1942) is an italian critic, art historian and university professor. 6. Angelo Crespi, About the line of black, a text about Lorenzo Puglisi’s work.